The National Army Museum has acquired Michael Alford’s painting, Patrol at Pan Kalay Police Station (above) for its national collection. The painting, a 9×12 oil sketch, was done while Alford was embedded as war artist with the 1st Mechanized Brigade in Helmand in May of 2013. It is one of a series of sketches done in the field showing the day-to-day realities of life for soldiers on the frontline of the Afghan conflict. 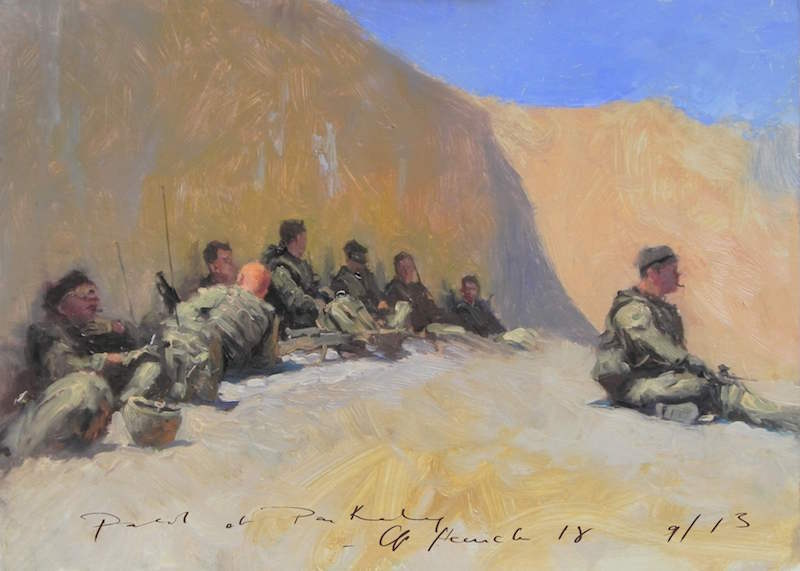 “This sketch was done during a visit to a patrol base near Gereshk when a patrol of the Royal Regiment of Fusiliers was organized to prepare the ground for a Shura (a meeting with local Afghans) to take place in the nearby compound of the Afghan Police Station at Pan Kalay. After we arrived, some fusiliers guarded the road outside the compound while others covered the British officers taking part in the Shura, since they were unarmed. The rest of the patrol rested in the minimal shade provided by the compound wall—at midday, the temperature was in the high 90’s or low 100’s. Staff from the National Army Museum chose the sketch for its “technique and its authentic depiction of a little-known side of the Afghan conflict”. Alford’s work will become part of the National Army Museum’s extensive collection, a world-class resource that charts the history and influence of the British Army through the centuries. See more Afghan paintings by Michael Alford.